All-Vehicle Mats (AVM) are advanced semi-universal Trim-to-Fit vehicle floor mats designed to trap fluids and debris from your car, truck, SUV or minivan's interior and protect it from unwanted dirt, grime and moisture. The WeatherTech AVM (All-Vehicle Mat) is made to fit virtually all vehicle flooring due to its unique shaping and Trim-to-Fit features. 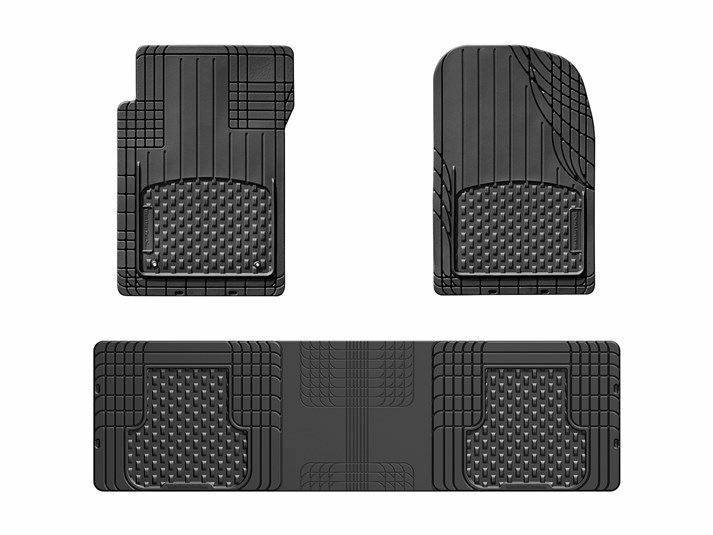 The degree of research and design that went into the production of this mat has significantly contributed to its sustained rank as being the highest rated all-vehicle floor mats among affordability, dependability and practicality. We spared no expense when it came to the durability and dependability of our AVM mats. The AVM Trim-to-Fit mat is made from our advanced rubber-like Thermoplastic Elastomer (TPE) compound that is an OEM approved, virtually odorless latex-free material, that contains no harmful PVCs, cadmium, or lead and is 100% recyclable! It also stays flexible in even the coldest of temperatures. The AVM's Trim-to-Fit shape helps deliver superior coverage for front and rear driver and passenger floors. The AVM mat is the first universal-style Floor Mat to incorporate specifically designed driver and passenger mats. The mats also feature a tall outer ridge and reservoir to help trap fluids and debris from the vehicle’s flooring. To ensure proper safety, the AVM Trim-to-Fit Mat features the patented MatGrip retention device, as well as molded-in nibs for a secure mat-to-floor interface. The combination of the high quality materials and ideal floor measurements, provided by the easy to use trim lines, ensure the AVM Trim-to-Fit Mat maintains the desirable attributes expected of a WeatherTech product. Remember – before you place your order, this is a trim-to-fit universal-type floor mat. If you wish to have a custom mat for your 1983 Volvo 244, please see our FloorLiner or All-Weather Floor Mats. Recently purchased two floorliners (fr/rear) in grey for my 19 Nissan Altima and an AVM trunk liner, also in grey. I've purchased from WeatherTech in the past for other vehilce and this time was no different. That is to say---Always excellent quality and exact fit. This was my first time to purchase the AVM but it's the same as the WeatherTech brand-First rate and a truly excepectional buy! The floor mats fit like a glove, they look amazing and delivery was super fast. Extremely happy with everything and can't wait to order more products for my highlander! The main reason I purchased the WeatherTech mats is because I wanted better mats for my car. When I wanted to purchase new ones I looked first for mats made in the USA. I have been very pleased with my WeatherTech mats. They stay in place and hold anything that falls on them. I had other people ride in my car expressed that my car looked great for being only five years old - I feel the WeatherTech mats gave my car the upgrade. I just purchased mats for my mom's car too. Thanks for making great products in the USA! Great product. Preserved my vehicle carpet. This product was worth every penny that we spent. Every vehicle that we buy will have these quality mats in it. This is our third set that we have purchased. If you want your car or truck to remain clean and cut down on your clean up time, buy these mats. They are a top quality product. We had our WeatherTech mats installed at the Cadillac dealership before driving our new car home and it was the best decision we ever made. These mats protect the interior from every day wear and tear and they are so easy to keep clean. We love them. I just purchased a set for our second car and I know I'll be satisfied. Thanks for making such a durable car mat. Wonderful product - is exactly as advertised. After my first car, I have since put these mats on my second car and ordered two sets for my daughter's minivans. Customer service .i.e. order and shipping is as stated. WeatherTech could give other companies lessons on product quality, truth in advertising and customer service. Unqualified recommendation. I'm very satisfied with these Floor Mats. They cost half the price I would have paid at Honda and they fit perfectly. I think they're even better, as they cover more area, including the foot-rest. More expensive than the regular mats from department stores, but there is no hassle having to cut them to make them fit. I would buy them again for another vehicle. It looks like these mats will last a long time! The quality of these mats are very nice. I live in Lake Tahoe so i am always around water either winter/snow, or summer via lake, as well as off-roading getting in and out of the truck can dirty up the inside and stain in the blink of an eye. Needless to say they are well worth the money hands down. They look extremely nice and are made very well. They cover more area then the stock one's - cheaper ones will allow water, dirt, snow, mud ect to either seep threw or flow off onto the carpet. What are the exact dimensions? What does “1st Row” mean? "1st Row" means the first, or front row of seating, driver and passenger side. Your set will include both pieces, unless it is a single-piece design. What does “2nd Row” mean? "2nd Row" refers to the row of seats immediately behind the first or front row of seating. Your set will include pieces for both driver’s side and passenger side 2nd row seating, unless it is a single-piece design. How do I remove the hanger? Can I purchase the AVM product anywhere else? Do I need to install the MAPB113KIT? While the weight of the mat will keep it largely stationary, we do strongly recommend using the MAPB113KIT for added security. What do you mean by “trim-to-fit,”? How do I trim these mats? The All-Vehicle Mats include trim lines on the on the mat that will guide you. For the best possible fit we recommend using your existing vehicle’s carpet map as a template, and using a standard pair of scissors. What’s the difference between All-Weather Floor Mats and AVM? All-Weather Floor Mats are custom made to fit specific makes and models of vehicles. The AVM (or All-Vehicle Mat) is made to be a semi-universal product that allows customers to trim the mat for the best possible fit for their vehicle. Am I able to purchase pieces individually, or is this product only available in full sets? AVMs are only available in 3-piece or 4-piece sets depending on your preference.